Successfully Added Nitro RC Racing Car With Remote Control - Base Kit to your Shopping Cart. 1:10 scale Nitro powered race car with pistol grip remote control. Most RC cars like this require extensive assembly. With this car all you need is some Nitro gas fuel and a starter kit (glow plug igniter) then you're ready to burn up the track! It comes as a pre-assembled unit with a light plastic sports car frame that can be easily upgraded or customized as you desire. This RC car is more than just any ordinary remote control car. It has 4-wheel drive, a two speed transmission and a Nitro powered engine. This is for the serious RC enthusiast or for the guy who wants to move-up from battery powered units to the major leagues! The price and specifications on this model are amazing, right? How are we able to offer you such a great deal? Simply by giving you a direct from manufacturer price. And with our no M.O.Q. policy and drop shipping direct to your door, we make it easy for you to enjoy your limited free time. This is a Nitro fuel powered RC race car. It has a 2-Speed Transmission and a 15 CXP engine with a pull-starter. The kit includes the RC car, a pistol grip remote and manual. Starter kit (igniter) is not included. 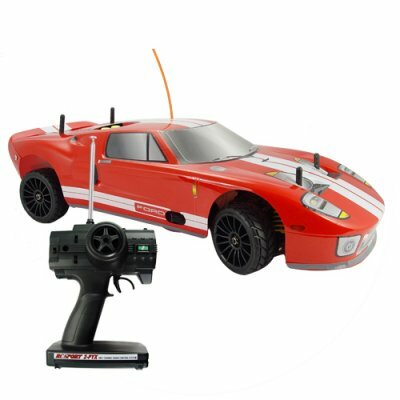 This RC car is very fast - up to 40MPH in stock configuration. Nitro methane fuel between 10% and 30% proof and igniter required for operation. i like! Bus i this sold out!